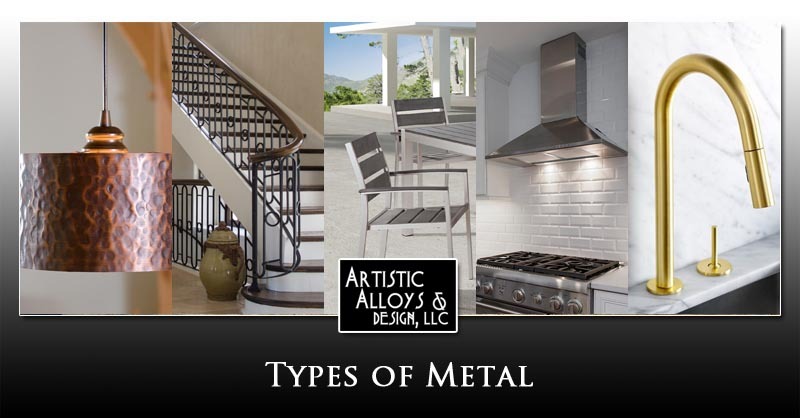 If you are searching for the different “types of metal“, this post should help! You may be interested as to what the various types of metal are. Keep reading to learn more. Copper is reddish-brown in color and is found on all kinds of home décor like sinks and lighting. Look for copper on higher quality cookware because of its exceptional heat conductivity. Copper can also patina to a greenish-blue over time due to oxidation. To stop this from happening (especially if the copper is going to be used outdoors), use carnauba wax and lacquer or coat with beeswax. Wrought iron refers to metal that has been forged, hammered or bent into shape, instead of being poured or cast. As a result, it has a more roughed up surface than other metals. Wrought iron is usually used to make lighting fixtures, rustic beds, fireplace accessories, stair railings, residential gates, and more. Stainless steel is an alloy of chromium, iron, carbon, and other types of metals. Stainless steel is found on fixtures and furniture all over the home, from kitchen and island sinks, to accent tables and chairs. Chromium doesn’t rust, oxidize, or corrode and is an easily maintained material. It is also much durable than its lookalike, aluminum. Aluminum is similar in appearance to stainless steel, but it is less strong and lighter than steel. It can be used as a low-cost substitute to steel. Aluminum also doesn’t rust, but it does oxidize, developing a chalky white residue. Aluminum is also frequently used in outdoor furniture. Brass is a yellowish, gold-like alloy of copper and zinc, brass is typically found on lighting and fixtures like faucets, light fixtures, knobs, and shelving. Although brass has a luxurious appearance, its maintenance is relatively low. Mild soap and water will keep it clean. As solid brass can be a little pricey, look for plated brass for a more budget-friendly cost. Artistic Alloys & Design, LLC is Phoenix, Arizona’s # 1 source for custom one of a kind metal installations. We work close together with our clients to fulfill their vision for metal entry doors, driveway gates, range hoods, or any other type of decorative metal feature. Call us at 480-490-2935 or CONTACT US here.